Come on Lexus, do better. Remember the LFA? 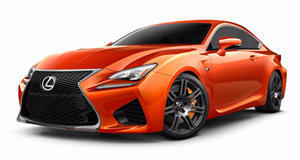 Not long ago we reported that Lexus had, in fact, not approved a high-performance version of its beautiful LC 500. A 600-hp LC 500 F is not in the cards, for the time being at least. Instead, Toyota Racing Department (TRD) has introduced something far less interesting and almost gimmicky: an LC 500 and LC 500h body kit. Based on what is saying, it appears buyers won’t have to buy the entire kit, but rather individual components. So, what are those components? There’s a front spoiler that’ll go for around $1,240, side skirts for $975, a rear diffuser with side spoilers for $1,240, and a rear spoiler for $800. Lastly, there are 21-inch forged aluminum wheels for a hefty $6,070. But hey, they do come with a full lug nut set. So there’s that. Honestly, while it’s nice to see TRD do at least something to enhance the LC 500 and its hybrid sibling, we know that Lexus could do better. A lot better. The . What really should be happening is that LC 500 F, and it should be powered by the twin-turbocharged 4.0-liter V8 that was previously rumored. A . But hey, there’s that body kit for over $4 grand all in, which contributes next to nothing for performance. If Lexus wants to be a serious player in the high-performance market (it's said it does), it needs to step up instead of believing body kits alone will be enough.